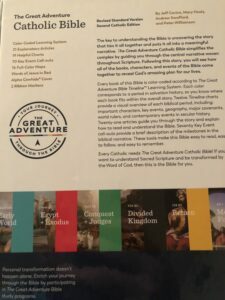 I frequently review resources, mostly Bibles, to help the faithful to grow in grace and in the knowledge of the Lord Jesus Christ and today I am reviewing the Great Adventure Catholic Bible from Ascension Press. 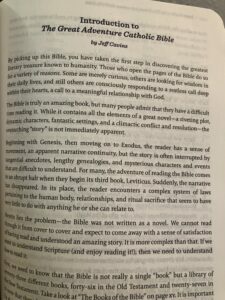 (Note: Ascension Press sent me this Bible free of charge in exchange for an honest review. My opinions are my own.) Full disclosure, I am not catholic but I did grow up in a household with a catholic parent. I am impressed at the number of resources that are available for Roman Catholics today. Growing up with one parent who was catholic and, one who was protestant, I cannot recall having ever seen the catholic parent read the Bible or even recall the encouragement to read a Bible. I am glad to see that this has changed and Catholics are being encouraged to own and read their Bible. 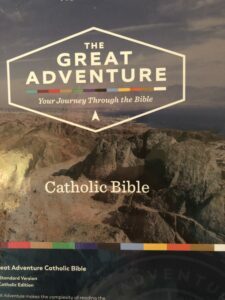 The Great Adventure Catholic Bible is offered in the Revised Standard Version, Second Catholic Edition (RSV2CE). 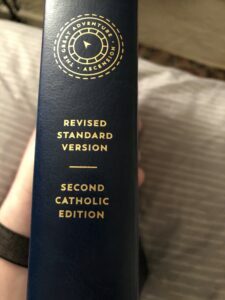 Of the two major English translations of the Bible used by Catholics, RSV2CE and the New American Bible Revised Edition, I much prefer the RSV. 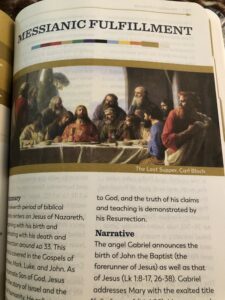 It is an essentially literal translation of the Bible that is still very readable and accurate to the original languages making it ideal for personal study or devotional reading. This is an alpha cowhide cover, which, to the best of my knowledge is a synthetic leather similar to the Trutone from Crossway. The binding is sewn for a lifetime of use. 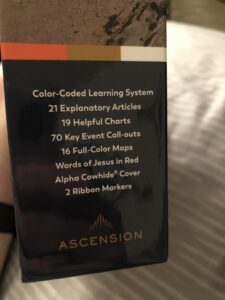 Ascension provides two ribbons for you to mark your progress in reading through the Bible. My personal preference is three ribbons, one for Old Testament, one for Psalms and Proverbs, and one for New Testament. That being said, any quantity larger than one will be most helpful. The array of helps is impressive and there are some that I would actually like to see in protestant Bibles. The cross references are located near the bottom of the text and they are separated by bold lines to mark them off from the text. 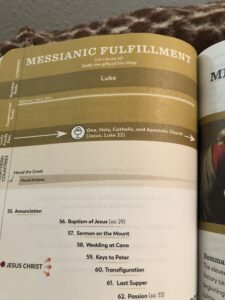 This is one of the features that I would love to see in more Bibles. 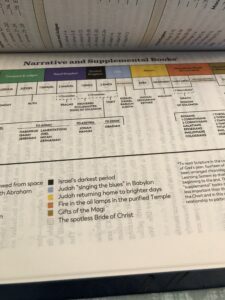 The color coded learning system follows the Great Adventure Bible Timeline. Each color corresponds to a period in Redemptive History. I absolutely love this; you can easily follow the stream of Redemptive History and watch the grace of God unfold! 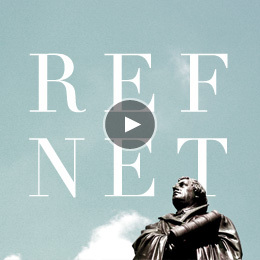 If you have ever wondered what comprises the most important events in Redemptive History, look here. 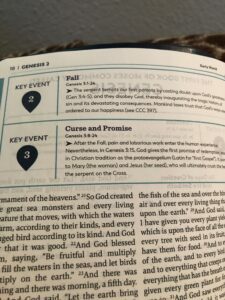 Each callout is only a couple sentences but the call your attention to the major events that you need to be familiar with as you mature in your Christian Walk. These charts are linked to the major sections in the timeline learning system. 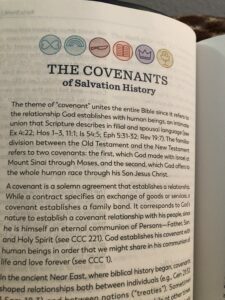 They cover such things as the Covenants in the Bible, key events, major characters, etc. They are designed to help the Bible come together as a cohesive unit. This one caught me off guard but I am delighted by it. 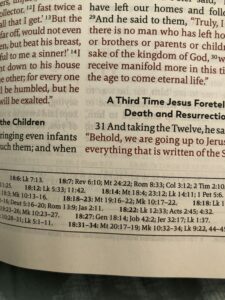 I do not think that I have ever seen a red-letter edition in a “Catholic Bible.” It is a true statement that I do not want a red letter edition in a Bible I will preach from because I make my marginal notes in red ink and they bleed together on me. 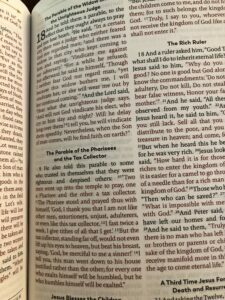 However, for a Bible that will be primarily for devotional reading, I love the red-letter editions. My goal as a pastor is to help my lambs to focus on the life and teachings of Jesus and a red-letter edition helps to emphasize those words. 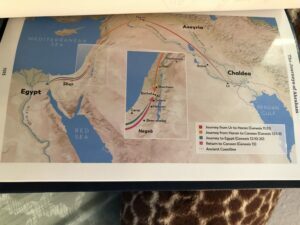 The maps, as in any Bible, will help you to visualize the lands of the Bible. 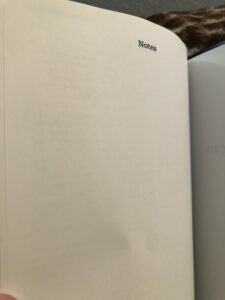 At the end of the Biblical Text, you will find some blank pages labeled notes. 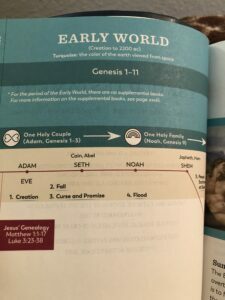 I am delighted to see this because they are not in most study Bibles. 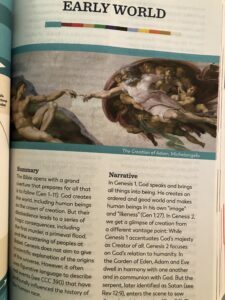 I highly recommend that every reader take notes of what the Holy Spirit teaches you as you study Scripture so, again, I am delighted that notes pages are offered. 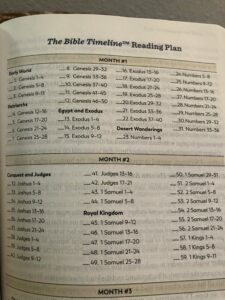 I had expected to find commentary in this Bible because it is classified as a study Bible; to my surprise there is not any commentary provided. 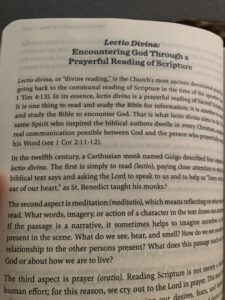 I had envisioned something akin to the Didache Bible from Ignatius Press and the Midwest Theological Forum with commentary based on the Catechism of the Catholic Church but it’s not there. This Bible is designed, almost entirely, for reading, which, of course, is the foundation of our growth as Christians. 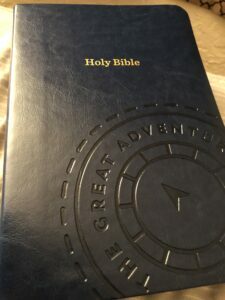 Overall, I am pleased with the Great Adventure Catholic Bible. 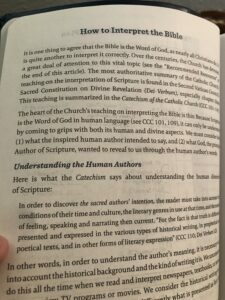 I am glad to see that there are resources being made available for Catholics who want to better understand the Scripture.